Oh my God, isn’t life just perfect!? That’s what Anna (Carly Schroeder) should be asking herself. After a whirlwind courtship and engagement, Anna has just married Richard Palmer (Phillip P. Keene), a famous mystery novelist! Not only is she a newlywed and it appears that she might soon also be newly rich. Her parents died mysteriously years ago and she stands to come into a lot of money! Of course, nothing is ever as perfect as it seems. Her psychiatrist seems to be concerned about Anna acting too impulsively and he worries that she’s marrying Richard without even knowing him. When Anna arrives at her new home, she is struck by how coldly she’s treated by the housekeeper. Anna soon starts to feel that everyone is comparing her unfavorably to Richard’s previous wife, the one who died mysteriously at the lighthouse. And when Anna discovers that Richard has apparently incorporated his first wife’s death into his latest book, she is not amused. Even worse is how Richard reacts when Anna dares to wear a necklace that once belonged to dead wife. And then there’s Beth (Kristin Minter), who seems friendly enough except that she’s awfully close to Richard. Of course, their closeness could have something to do with the fact that she’s Richard’s mistress. You know what they say: Just because you’re paranoid doesn’t mean that they’re not out to get you. With all of the gothic scenery and the insecure wife and the hostile housekeeper, I was expecting Deadly Shores to just be another version of Rebecca. And, certainly, the first hour or so has much in common with that classic film. However, in the best grindhouse tradition, there’s a big twist that occurs during the final seven minutes of the film, one that totally turns the entire movie upside down. I won’t ruin the twist but I will say that it was a hugely satisfying one. In the end, Deadly Shores reminded me of one of those strange movies that Joan Crawford and Olivia de Havilland would have made for William Castle or Robert Aldrich back in the 1960s. Deadly Shores is one of the many movies to have been directed by the prolific Fred Olen Ray. What his films often lack in budget, Ray makes up for in pure entertainment. Ray does a pretty good job directing this one, playing up the ominous atmosphere and giving Carly Schroeder enough room to go enjoyably over-the-top in the role of Anna. All in all, Deadly Shores is an entertaining Lifetime film and one to keep an eye out for. Let’s face it, Lee Van Cleef was one cool hombre, and he’s at his coolest in SABATA, the first film of a trilogy written and directed by Gianfranco Parolini (aka Frank Kramer). 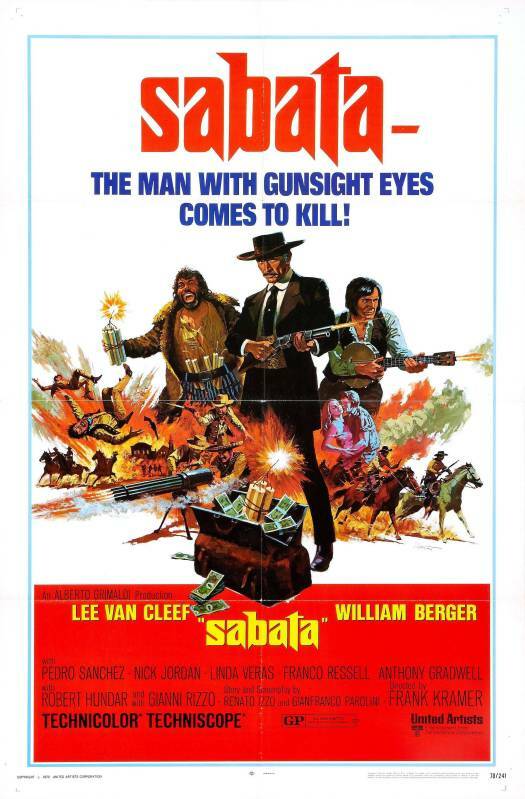 The beady-eyed Van Cleef is obviously enjoying himself as Sabata, a trickster with a sinister chuckle and an array of tricked-out weapons who always manages to stay one step ahead of the bad guys. This morning, I watched the latest Lifetime premiere movie, Lethal Soccer Mom! Seriously, how could anyone resist a movie with a title like Lethal Soccer Mom? Actually, according to the imdb, this film was originally titled Sidelined so I’m going to guess that Lifetime changed the title so it could fit in with their “lethal” series of films. Personally, I think Lifetime probably made the right choice here. Sidelined isn’t bad but Lethal Soccer Mom just demands to be watched. For the record, the film itself actually premiered on Friday night but since I was out, I set the DVR to record it. Kate (Tanya Clarke) and her teenage daughter, Cameron (Sarah Grey) have just moved into a new home and Cameron is starting at a new school. Cameron can’t wait to join her school’s soccer team but she soon discovers that the team’s star player, Hailey (Hannah Vandenbygaart) views her as being a rival. Complicating things is the fact that Hailey’s mother, Rhonda (Christina Cox), is the coach of the team and worries that Cameron might overshadow her daughter. As messy as that sounds, it gets even messier when it turns out that Rhonda is willing to do anything make her daughter a star. Soon, Cameron is being pushed down stairs, getting beaten up at practice, and even her grades are being tampered with! How far is Rhonda willing to go to keep Cameron off the team? When your movie has a title like Lethal Soccer Mom, you’re being promised a certain amount of melodramatic excess and this film certainly delivered on that promise. Tanya Clarke, Christina Cox, Sarah Grey, and Hannah Vandenbygaart delivered a quartet of fine performances. Christina Cox, in particular, really seemed to be having a lot of fun as she did everything from seducing her daughter’s boyfriend to chasing her daughter’s rival around the high school with a bat. A Lifetime film is usually only as good as its villain and Cox turned the coach into a great one! Lethal Soccer Mom also did a good job of suggesting that, under different circumstances, both Kate and Cameron could probably be just as obsessive and dangerous as Rhonda. In fact, the only person who didn’t seem to be way too obsessed with soccer was Hailey. It all worked! This is the type of Lifetime films that I love: outrageous, melodramatic, over the top, a little bit silly, and consistently entertaining. I never played soccer, both because of my asthma and also because it always seemed like everyone I knew was playing soccer and, even at a young age, I always had to be different. Two of my sisters did play but, when we were growing up, my family moved around too much for any of us to ever get caught up in too much team drama. Fortunately, my mom never had to become a full-fledged soccer mom. However, because I was in love with dancing, my mom did spend several years dealing with other dance moms. Let me tell you, crazy soccer moms have got nothing on crazy dance moms. That those were my eyes? Valerie already shared two other videos for Dangerous. Here’s another one of Big Data performing at Los Angeles’s KROQ Red Bull Sound Space. While the studio version features Joywave’s Daniel Armbruster performing the vocals, this live version is performed by Alan Wilkis and Liz Ryan.